Nanotechnology breaks down and modifies elements at their molecular level, and new uses have been found for all kinds of materials, including silicon nanoparticles. Researchers have applied this versatile technology to a wide array of products, and the latest to be enhanced is the silicon solar panel. Researchers at the University of Illinois worked with several institutions in Saudi Arabia to increase the efficiency and performance of the conventional solar panel, and found that by using nanoparticles of the same material the solar panels were made out of, they could create a thin coating for the panel that would enable it to perform all its normal functions with greater speed and efficiency. The silicon nanoparticles the team applied to their solar panel measure only 1 nanometer in diameter and were not obvious to the naked eye, yet they increased the solar panel’s abilities by 60%, according to physicist Munir Nayfeh of the University of Illinois. Many of these gains took place in the ultraviolet light spectrum, but a 10% increase in functionality was also observed in the visible light spectrum when the silicon nanoparticles were increased to 2.85 nanometer size. Without the coating of nanoparticles, normal solar panels typically function in the visible light spectrum. Researchers knew that the ultraviolet spectrum provided huge untapped resources of energy, but were unsure how to access the UV rays properly; conventional solar panels don’t handle UV rays very well. Some types of solar panels filter out UV rays entirely and others inadvertently absorb the rays, which can actually cause heat damage instead of the desired electrical current. Then, in 2004, Munir Nayfeh came along and drew up a brilliant plan showing how adjusting the size of silicon nanoparticles and applying them in a separate coating could provide solar panels with the ability to process UV rays the same way that they had typically processed visible light, and in some cases, with greater efficiency than anticipated. Nayfeh assembled a team of university researchers and got to work. The first step in the process involved physically breaking the silicon material down into silicon nanoparticles, after which they could be molecularly engineered to alter their properties if necessary. The desired chemical change was achieved by dispersing the silicon cells into a solution of isopropyl alcohol and mixing the two elements together. The silicon nanoparticles could then be effectively applied to the solar panel’s surface and as the isopropyl alcohol evaporated over time, the silicon particles remained firmly affixed and evenly distributed on the surface of the panel. Energy gains of up to 67% were recorded, and most impressively for solar panel enthusiasts, ultraviolet light could now be harnessed as energy. As a nice little finishing touch, Munir Nayfeh designed the coating process to be extremely cost-effective for solar panel manufacturers, so that his updated version of this earth-friendly classic is a winner for everybody involved. This huge leap forward in the development and use of silicon nanoparticles reached its peak in late 2007 and early 2008. More recently, researchers have been able to develop a new method of synthesizing silicon at the nanoparticular level, resulting in a whole new set of possibilities for this useful material. The synthesis has a surprising effect on the nanoparticles—it makes them fluorescent. Researchers anticipate that this will ultimately help lab technicians to track the way that drugs are absorbed by human cells.Whilst researching the scientists need to wear nanoparticle masks. Dr. Klaus von Haeften is one of the key researchers on this project. He explains that processing the silicon nanoparticles in this updated way allows lab technicians to have independent control of every aspect of each particle; they can change the particle size and alter its surface properties to suit their needs. Pre-programming the particles in this way is what allows them to be so easily modified into fluorescent particles. The research team expects that among other things, fluorescent nanoparticles will revolutionize the way that electronic chips behave in technology and also increase their integration density, something that the modern market holds in very high esteem. The team of scientists who discovered how to make the particles fluorescent tried a number of different methods before hitting on the one that finally worked. They ultimately reduced the nanoparticle size to a mere few hundred atoms and mixed these tiny altered particles with water. To their delight, the resulting fluorescent glow was strong enough that it lasted more than three whole months before fading. This study took place at the University of Leicester. Soon other scientific departments inside the school were getting involved, with researchers from the Department of Chemistry making headway in the new synthesis process as well. They thought that perhaps the silicon nanoparticles were processed in the right way to make them good candidates for cancer treatment—they would hook treatment drugs to each particle and then send the combined dosage into a patient’s bloodstream to test its effectiveness. The procedure worked even better than expected, since the fluorescent light emanating from each individual particle made them extremely easy to track once they had been introduced into the system. Silicon is a perfect drug vehicle because by nature, it has no outstanding characteristics of its own. Silicon is a benign, neutral substance that, when rendered fluorescent, becomes an excellent marker for tracking biological materials of a sensitive nature. This means that if it became part of regular cancer treatment procedures, it might have the potential to lessen any unpleasant side effects that would come as a result of the normally harsh chemotherapy. 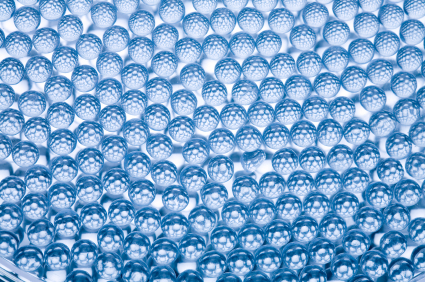 Silicon is revolutionizing the technological and medical industry in its nanoparticle form. The ramifications of silicon nanoparticles’ ability to withstand a number of different forces while still achieving high performance levels makes it a perfect element to use in the development of the nanotechnology field. It’s a surprising development for a material that made its debut at the dawn of the computer age and was then promptly degraded as a plastic surgery insert for several years afterward. Now silicon is back to make another big splash in the technological world, and it’s bigger—or should we perhaps say smaller?—and better than ever. This entry was posted on July 5, 2009, 12:36 am and is filed under nanoparticles. You can follow any responses to this entry through RSS 2.0. You can leave a response, or trackback from your own site.